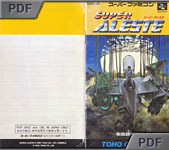 Super Aleste is an intense vertical shooter by Compile and, as the name so aptly implies, is part of the classic and critically acclaimed "Aleste" series. In the year 2048 AD, a strange giant sphere appears from the depths of space and starts attacking Earth cities. It eventually stops in South America, over the Amazon jungle, where it starts building a giant floating city. The Earth Allied Forces decide to launch a counterattack and to deploy their most priced fighter - the 'Aleste' - to eliminate the invader. But the fighter is quickly overwhelmed by a swarm of phenomenal power and fails in its mission. Although in a desperate situation, the Earth Forces don't surrender and they begin the construction of the 'Super Aleste'. The new elite pilot Raz and his female alien co-pilot Thi are now on a suicide mission to destroy the sphere and thus to put an end to the invasion. The Super Aleste fighter is packed with serious firepower and no less than eight different weapons can be equipped (such as homing missiles, guided options, lasers or multi-shots). Additionally, each weapon can be upgraded to a maximum of six times (by collecting orange orbs or green weapon-pods) and all have two different modes of action that can be switched at any time during gameplay. Beside, the power upgrades double as a shield and the active weapon's power downgrades each time the fighter receives a hit, and at zero the Super Aleste goes to oblivion. Finally, super-bombs are of course available and used to wipe out most of the enemies on screen in case of a sudden emergency. Super Aleste consists of twelve levels (four are bonus stages) and also includes a 'short' option which acts as an intense 'score attack' mode. Aleste is certainly one of the few names most associated with the prolific, and sadly defunct, video game company Compile (the other being the excellent 'Puyo Puyo' puzzle series). 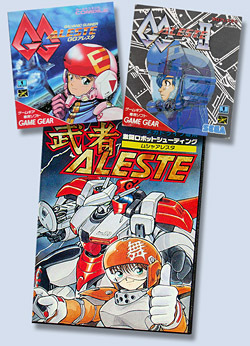 The first Aleste was released in 1988 for the MSX 2 and Sega's Master System (the Master System version is also known as 'Power Strike' in the rest of the world). A pseudo-sequel called Power Strike II was released for the Master System in 1993 (only in Europe), but it is not really related to the Aleste series (the game takes place in the early 1930s, in Italy, right after the great depression). Anyway, back to Aleste - the original game shares a lot in common with Zanac, another vertical shooter by Compile and originally released in 1986 for the MSX and Famicom Disk system. Many players consider Aleste as a sequel to the excellent Zanac, and this may not be too far from the truth as they both feature a space theme, a fast and frantic gameplay, as well as a difficulty level that automatically adapts to the player's skill level! 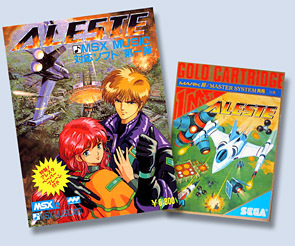 A sequel to Aleste, simply called 'Aleste 2', followed in 1989 for the MSX 2. Aleste Gaiden was also released for the MSX 2 the same year and, I believe, was only available as part of Compile's disk Magazine Disc Station and included in the Autumn 1989 edition. However, Gaiden features noticeably different design and gameplay mechanics. Apparently, both sequels were exclusively released in Japan and Aleste Gaiden stands out for many interesting reasons - it actually introduced robotic samurai armors and a distinct medieval Japan theme to the series, which will later be at the heart of Compile's Musha spin-off series (more on this later). 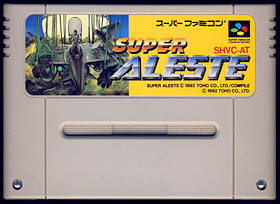 Super Aleste followed in 1992 for the Super Famicom (version tested here) as well as two other Game Gear games, namely GG Aleste (1991) and GG Aleste 2 (1993). Interestingly, GG Aleste 2 was renamed Power Strike II in the west, but it is in no way related to Power Strike II released for the Master System in 1993! As aforementioned, the Aleste series somewhat branched out with Musha Aleste (aka M.U.S.H.A in the US) released for the Sega Megadrive in 1990. Compile dropped the science fiction theme introduced by the early games in the series and borrowed instead elements from Japanese feudal history and folklore, such as giant stone castles, mechanical beasts, ancient demons and samurai warriors. A sequel followed for the Sega CD in 1993 (aka Robo Aleste in the US). Interestingly, another game released for the PC Engine Super CDRom shares a lot in common with Musha - Seirei Senshi Spriggan was released in 1991 and shows incredibly obvious similarities with Musha Aleste. Although the game was published by Naxat Soft, it was indeed developed by Compile. The same applies to the excellent Gunhed released for the PC Engine in 1989, and which shares a lot in common with Super Aleste! There are a couple of interesting differences between the original Japanese game and the western releases. Particularly obvious is the boot-up screen, although the Japanese version doesn't have any, the American release starts with a copyright screen and a digitized voice that says the name of the game ("Space Megaforce!") - while the European version says "Presented by Toho". Another surprising difference is the omission of all references to the anime-style characters seen in the original game - both the pilot and the female co-pilot were removed from the option and game over screens, as well as the introduction and end sequences (pictures on the right). As a side note, the Japanese end sequence also shows that Thi (the co-pilot) plays an important role in defeating the alien invader and this part was completely removed from the western release... The story was also heavily edited, as well as the name of the various areas and bosses. Finally, the music tracks for the bonus stages (levels 3, 6, 9 and 10) were swapped around and one track was entirely removed (well, this track does sound awfully close to several New Order's hit songs, such as 'The Perfect Kiss' or 'Fine Time', and this potential copyright infringement may explain the removal). Finally, the voice message played each time the player collects a power-up was re-recorded for the western releases and arguably sounds better. A patch was released by Frank Hugues that unlocks the game original debug mode. This patch adds several interesting options, such as invincibility, stage select, skip ahead to the end credits, a graphic viewer as well as various options to modify weapons, lives or bombs during gameplay. A super mid-air battle! Do you want to experience a high speed shooting packed with excitement? "Space Megaforce". The game's thrilling speed is its most attractive feature. The enemy movements are fast. Your shots and the enemies' shots are fast. Finally, the scrolling is fast. The screen filled with battle action just overflows with high speed shooting excitement. On top of that there is the Shot Control System operated with the "R" button. You can attack the enemy in a multitude of ways with a weapon using this system. Naturally, the features of the Super NES such as rotations, enlarging, and shrinking functions are used to their fullest and huge enemies never before possible are packed into this exciting MEGA game! 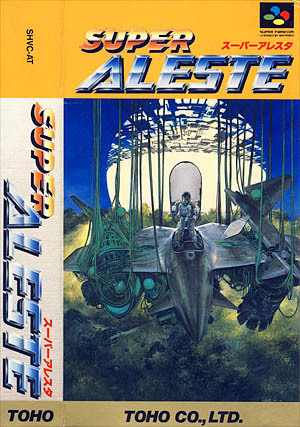 Super Aleste is an incredible game and probably the best vertical shooter available for the Super Famicom system. Graphics are superb with highly detailed sprites and awesome visual effects (the second level's space station is breathtaking!). Then the game follows all the Compile's shooting traditions by the book - so be ready for a fast, intense and breathtaking experience (the game does really remind me of Gunhed for the PC Engine). The screen is always swarming with enemy ships, bullets and the arsenal of upgradable weaponry at your disposal is probably the most destructive I have ever seen in the shooter. And all of this with no noticeable slowdowns! Fans of other Compile shooters will have a mild feeling of déja-vu but will feel right at home! Some explosions even sound like the ones found in Gunhed for the PC Engine and the overall difficulty level (but this is just a guess) seems to adjust itself to your firepower like in the excellent Zanac. The game may not please all shooter fans though and the constant frenzied action may not suit everyone... some levels can also be quite long and repetitive. But all in all, Super Aleste is a gorgeous 'tour de force' and an unbelievable game. A brilliant masterpiece that deserves the "SUPER" prefix, unlike others.